Our Winnipeg EverLine location provides high quality and professional line painting services to all of Winnipeg and surrounding communities. We use premium materials and equipment and can work within your business’s budget. If you are in need of outdoor parking lot line painting services in Winnipeg or its surrounding areas, the line painting experts at EverLine Coatings and Services are here to help. EverLine Coatings and Services started its operations by line painting outdoor parking lots and has learned the needed skills to paint any lot efficiently and effectively. With our decades of experience, we have seen and painted every kind of outdoor and indoor parking lot that you could imagine. No job is too big, small or complicated for the outdoor parking lot line painting specialists at EverLine Coatings and services. 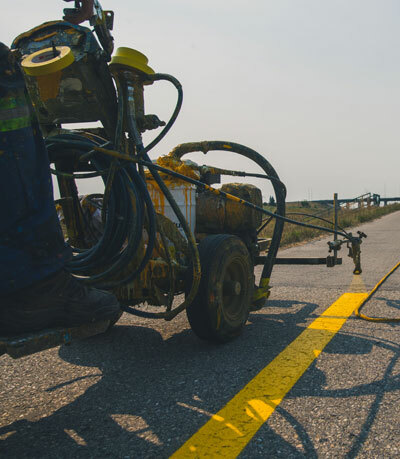 Our Winnipeg location employs several line painting crews enabling us to work on up to four business locations simultaneously and ensure that the line painting projects are completed professionally and on time. Our experienced Winnipeg parking lot line painting crews enable us to help you out with any of your line painting needs on short notice. If you require immediate parking lot painting to be completed quickly and professionally, EverLine’s Winnipeg parking lot line painting crews are available and ready to serve you. We are also able to offer businesses in Winnipeg the best quality work with the best value in the industry as well. This is because we are one of the largest line paint purchasers in Manitoba. We purchase our paint in bulk to save on material costs and deliver better value with every line painting job that we complete. Please contact our Winnipeg EverLine Coatings and Services office for more information on our outdoor parking lot line painting services. At EverLine Coatings and Services, we prioritize high-quality work over everything else. We are continually innovating our services and procedures to ensure we can provide the best value and service to our customers. If you’re in need of our parking lot line painting services in Winnipeg, we will always answer the call. Our line painting professionals only use the best line painting products and equipment available to ensure that each job is completed to the highest standard. EverLine Coatings and Services takes pride in being a well staffed and equipped line painting service company that maintains a small business mentality towards its services. Our industry-leading multi-crew approach gives us the ability to provide our line painting services to multiple locations at once. 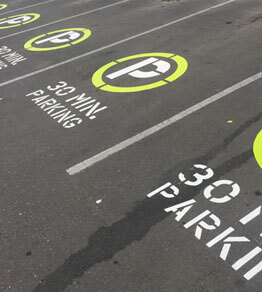 If your business has several parking lots that need to be painted simultaneously, we can deliver. Our multiple crews also enable us to provide line painting services to businesses that may be in urgent need of them. If your business requires immediate line painting services, we can handle it. EverLine Coatings and Services is one of the largest line paint purchasers in Canada. We save money on our products by buying them in bulk, and we can pass our savings onto you. We have experience working within a variety of different budgets and can work with your business to provide services that work within your unique budget. A big part of being the best line painters in Canada is ensuring that we are offering the best products available to our clients. At EverLine Coatings and Services, we use TBL Durables which are some of the best line painting products on the market. TBL Durables offers an industry-leading set of line painting products that have significantly better longevity than other conventional line paints. To learn more about the advantages of TBL Durables versus other conventional line paints, click here. At EverLine Coatings and Services, we take pride in being considered the line painting experts within the industry. We have decades of parking lot line painting experience under our belts, and we are considered to be one of the best line painting services in Canada. No matter how difficult the job or how complex the lot to be painted may seem, our experienced crews have seen it before and are ready to get the job done. Are you in need of having your parking lot lines repainted? We can repaint any parking lot line, curbs, stencils (all types or colours), crosswalks, stop bars, arrows, or handicap parking stalls you may need to be painted. Are you looking to improve or revamp the layout of your parking lot? We can help. We have years of experience planning and designing effective parking lot layouts to ensure the safety of the people using your lot as well as maximizing the amount of space available in the lot. If you’re looking to improve your parking lot, the experts at EverLine Coatings and Services can execute with top-notch quality and professionalism. Our new Winnipeg parking lot layout projects always look fantastic and exceed client expectations. Are you looking to have lines repainted on your road or street? At EverLine, we can repaint it all. We have extensive experience repainting municipal roads and streets with all different types of lines and markings. Whatever your road line painting needs are, the line painting experts at EverLine Coatings and Services can help. When it comes to line painting products, the expertise of the team, their craftsmanship, as well as their quality and precision make the difference between a great looking result and a mediocre looking one. At EverLine Coatings and Services, we only deliver great looking projects, as we have an unfaltering commitment to being the best line painters in Canada. If you need a line painting project completed professionally, then you will want it done by the line painting experts at EverLine Coatings and Services. If you’re going to be having your parking lot, road, pathway or another surface painted by the line painting experts at EverLine Coatings and Services soon, there are steps you can take to prepare. If you’re able to prepare your surface for painting before our crew’s arrival, it will help them complete the line painting job promptly and ensure a good result. Firstly, to ensure the longevity of the paint being applied and a precise application, please have your parking lot swept before our line painting crews arrive. Next, please ensure all vehicles have been removed from the parking lot or roadway so that our crews have an adequate amount of room to work. Also, please make sure that any obstacles such as dumpsters, shopping carts, and all of the debris has been cleared from the parking lot. Finally please notify your tenants, customers, or employees of the line painting project in advance. This ensures out crews safety and helps them complete the job as efficiently as possible. At EverLine Coatings and Services not only are we committed to delivering quality and expectation shattering results, we are also focused on delivering value to our clients as well. Each of our franchise owners are business owners too. We understand that businesses have budgets they need to follow, and we have experience working within various budget sizes to accommodate different projects. This is why all of our pricing is done on a job by job basis. When it comes to line painting different lots and roadways, many different factors can affect the pricing, and we require all of the available detail possible to provide the best possible price. To receive a quote on your line painting project, please contact us.